The section of ice set to break off could be around 2,000 square miles in area. Researchers with Project MIDAS, working out of Swansea University and Aberystwyth University in Wales and studying the shelf by satellites and through other techniques, have released a new update showing that the crack grew a stunning 11 miles in the space of just one week between May 25 and May 31. It now has just 8 miles to go before an iceberg roughly the size of Delaware breaks free into the Southern Ocean. Elsewhere in their post, they note that the crack has now curved towards the front of the ice shelf and the ocean, meaning that the time when a major break could occur "is probably very close." The researchers have estimated that the section of ice set to break off could be around 2,000 square miles in area. The U.S. state of Delaware isn't much larger than that. 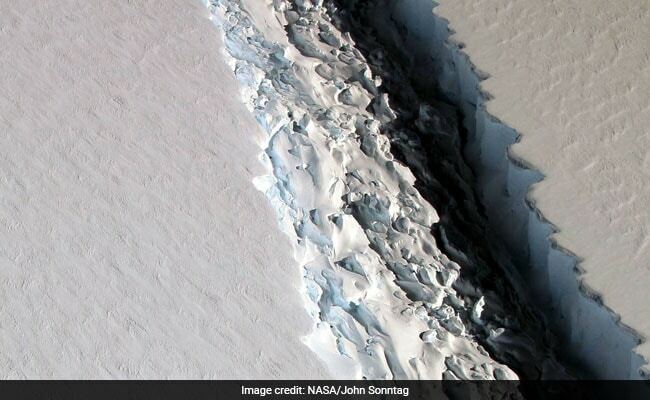 "When it calves, the Larsen C Ice Shelf will lose more than 10% of its area to leave the ice front at its most retreated position ever recorded; this event will fundamentally change the landscape of the Antarctic Peninsula," write the Project MIDAS team. "We have previously shown that the new configuration will be less stable than it was prior to the rift, and that Larsen C may eventually follow the example of its neighbour Larsen B, which disintegrated in 2002 following a similar rift-induced calving event."